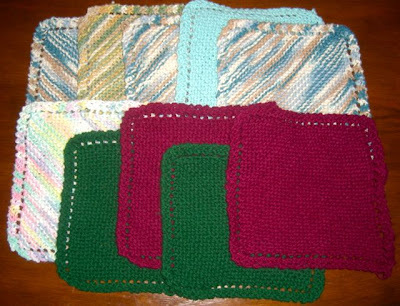 There was sale on Handicrafter Cotton yarn recently and I planned on picking some up so I could knit some dishcloths. The only problem was, I already had a tonne of the stuff in my yarn stash, and I haven't been knitting much lately. So I made myself a deal: use up all the yarn in my stockpile and I could buy more. It was a pretty motivating deal, as I have since knit ten dishcloths! I guess I really hate missing out on a yarn sale! I only have about five more to knit before I get to replenish my stock. I hope there is a sale, as I am excited to pick up some fun new colours! I love having a pile of these around! When I worked at the craft store, these were a big hit with the ladies. For awhile, everyone was making them. All kinds of fun colours.